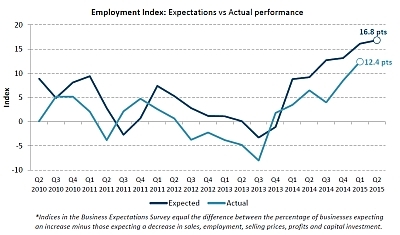 According to Dun & Bradstreet’s Business Expectations Survey, the latest lift in hiring intentions comes during a period when fewer businesses are anticipating increased sales or profits, with below-trend growth continuing to subdue the economy. Survey responses have seen the Employment Expectations Index rise for a seventh consecutive quarter, with 27 per cent of businesses indicating they will hire during the second quarter of the year, up from 24 per cent in the previous quarter and 22 per cent last year, while 10 per cent plan to reduce staff. This has seen the index move from a level of -3.3 points in Q3 2013 to 16.8 points in Q2 2015. Reported employment activity also increased, with Dun & Bradstreet’s Actual Employment Index moving to 12.8 points for Q4 2014, compared to just 3.5 points a year earlier. According to the survey, 25 per cent of businesses increased staff during the last three months of 2014 while 13 per cent reduced their numbers. The findings on hiring intentions follow relatively upbeat numbers from the ABS, showing that unemployment eased to 6.3 per cent in February, and provide a positive point from a business sector concerned about weak consumer demand. According to the Dun & Bradstreet survey, 40 per cent of businesses consider consumer confidence the issue most likely to impact their operations in the upcoming quarter, ahead of factors including the level of the Australian dollar (17 per cent), cash flow (13 per cent) and interest rates (5 per cent). Additionally, when asked to rate the biggest barrier to growth in the year ahead, 24 per cent of businesses identified weak demand for their products and services. This was the most common response, ahead of issues including access to skilled labour (15 per cent), online selling by competitors (14 per cent) and operating costs (14 per cent). “It’s clear that businesses have generally checked their expectations as official forecasts for economic growth continue to come in at less than three per cent,” said Josh Maher, corporate affairs manager at Dun & Bradstreet. “The exception is on the employment outlook, which has gradually risen from the negative readings measured in late 2013 to the point where nearly three-times as many businesses are planning to hire in the next quarter compared to those that will cut staff, while the majority will maintain current levels. “Significantly, the services sector – the country’s biggest employer – is most upbeat about employment in the next three months, with 36 per cent indicating they will hire staff during that period,” Mr Maher noted. Nearly one-in-three businesses in the construction industry, and also the finance, insurance and real estate sector, indicate they will increase employment during Q2 2015, with Australia’s strong housing and building activity appearing to drive the 10 per cent jump in construction sector expectations. Benefiting from a lower currency-exchange rate, manufacturers have also lifted their employment outlook, with 25 per cent planning to employ new staff in the next quarter, compared to 16 per cent a year earlier. 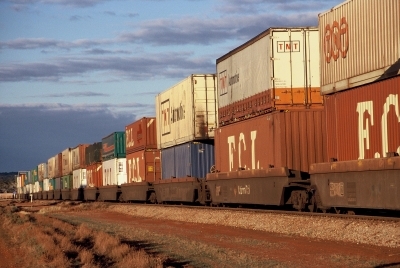 Meanwhile, the wholesale trade sector recorded the only decline in hiring intentions compared to the previous year, with18 per cent planning to lift their employment activity in the three months to June, down from 22 per cent last year. Whilst employment intentions have edged higher, second quarter expectations for sales, profits, selling prices and capital investment have all declined compared to the previous quarter. The Sales Expectations Index has fallen to 32.7 points, from 38.7 points last quarter and 33.6 points last year, with 46 per cent of businesses anticipating a lift in sales compared to 13 per cent which forecast a drop. Meanwhile, the Profits Expectations Index has dropped to 18.1 points from 25.9 points in the previous quarter and 20.7 points in Q2 2014. Thirty-five per cent of businesses anticipate higher earnings in the next three months, while 17 per cent expect a profit drop. Despite easing quarter-on-quarter, business investment plans are higher than a year earlier, with Dun & Bradstreet’s Capital Investment Expectations Index moving to 12.6 points, up on the 10 points measured at the same time last year and down from 14.9 points last quarter. “The downturn in business expectations for sales, profits and capital expenditure has continued into the June quarter,” said Stephen Koukoulas, economic adviser to Dun & Bradstreet. “This disappointing news fits with signs of weaker economic growth, a sharp fall in private sector business investment and what is increasingly an entrenched period of sub-trend economic performance. “The impact of the slump in commodity prices and ongoing policy uncertainty are clearly behind the weakening trend in business expectations. “The one relatively bright point is the continued, moderate increase in employment expectations which is likely linked to record low wages growth rather than a strengthening in economic conditions,” Mr Koukoulas added.